Something happened last week that gets me about as excited as Christmas, eating sauteed onions and buying a new kitchen appliance. The Great British Bake Off!!! To celebrate the start of this 11-week extravaganza I thought it was necessary to create an epic cake in honour of Mary Berry. But despite my LOVE of GBBO I don’t love how I feel eating refined sugar and gluten-filled cakes. So in true Super Naturally Healthy Style I made one with natural, wholesome and healing ingredients...because I actually like to eat cake when watching the Bake Off so I needed something I can eat !! I have gone traditional, inspired by the classic Victora sponge. 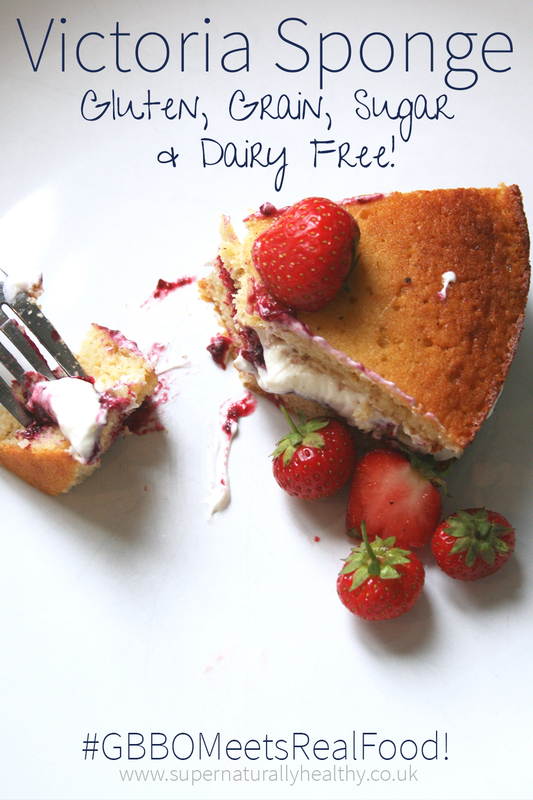 I have given it a fabulously healthy twist, it’s 100% dairy, gluten, grain and refined sugar-free….but still tastes GOOD. I know – right?! Coconut flour is the flour used and is a tricky beast, this is the one I used for this recipe and this is the coconut oil I have on ‘Subscribe and Save’ on Amazon. Coconut cream you can get at most supermarkets in a carton, or failing that place a can of coconut milk (full fat of course!!) in the fridge overnight and scoop out cream at the top the next day (don’t shake it up!!). If you want more dairy, gluten, grain and refined sugar-free recipes; that are simple and are going to do your (and your families) body GOOD, then make sure you check out The Sweet Treat Collection Recipe eBook . Cos – you can have your cake and eat it! 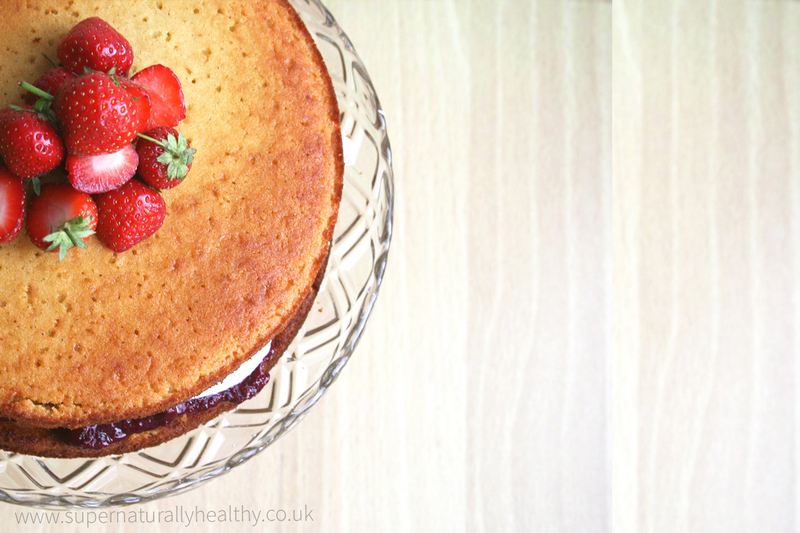 A fabulous paleo, gluten free, GAPS and healing verison of the class Victoria Sponge! Preheat oven to 160c or 180c is not fan assisted. Grease and line two 17.5cm sandwich cake tins - don't miss this step! Whisk the eggs, honey, vanilla until fluffy. Mix the dry ingredients roughly. Whisk the cooled but melted coconut oil into the egg mixture until fluffy. Slowly sieve in the dry ingredients and combine until there are no lumps. Place equal measure of the mixture into the greased sandwich tins. Place in the oven for 20mins on the same shelf. Remove from oven when brown and springy to touch and allow to cool completely. ASSEMBLE - do this immediately before serving! 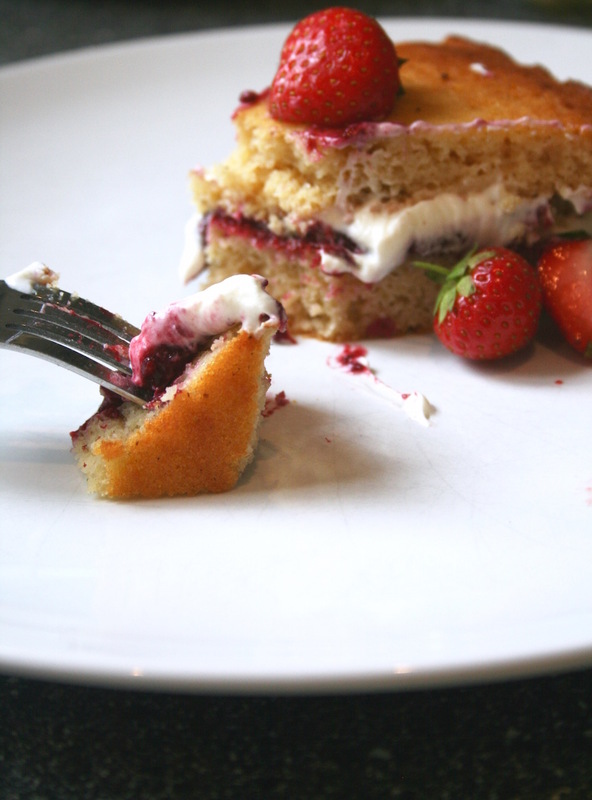 Simply turn bottom cake layer upside down to create a flat layer for the filling and place the jam on the bottom. Then add the greek yogurt or coconut cream* and gentle place top layer on top. serve immediately but will keep for 2-3 days in the fridge. Coconut flour soaks up sooo much moisture!